MacHeist today launched its latest software bundle, offering consumers the chance to purchase several popular indie games at a discounted price. 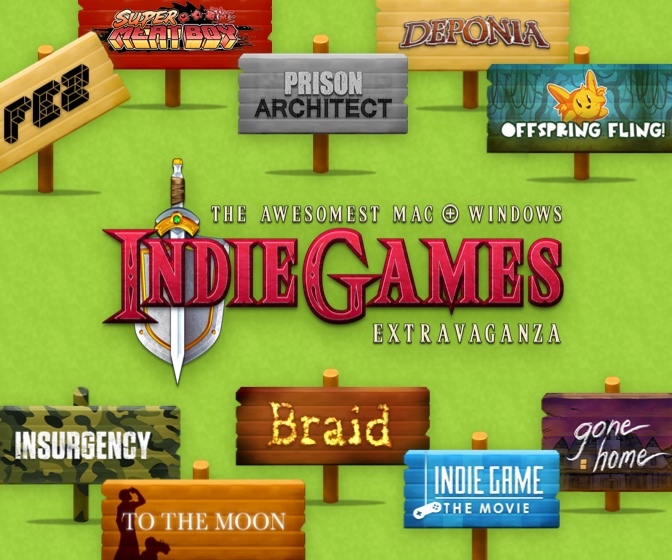 The Awesomest Mac + Windows Indie Games Extravaganza features 9 games that are compatible with both Mac and Windows Machines. The first three games in the list below are unlocked with a payment of as little as $1, while the full list of games can be unlocked with a payment of $20. Indie Game: The Movie is also included. The last two games, Fez and Prison Architect, will be unlocked for all purchasers when once certain sales targets are met. The bundle can be purchased from the MacHeist website for the next 10 days. MacHeist is also giving away prizes and other free software titles (Defend Your Life, A Bird Story, and Cloud Knights) through a mini adventure game on the website. 10% of each bundle purchased will be donated to charity, with each person who purchases a bundle able to pick the charity of their choice. MacRumors is an affiliate partner of MacHeist. I was going to ask here if people thought this was worth it. Sounds like it totally is from the first few posts!!! Braid and Super Meat Boy are each on my list of greatest games ever. Indie Game: The Movie is fine... It's free to stream on Netflix. I've heard of Fez (from IG: TM) but haven't ever played. Is the bundle worth it even if I already have SMB and Braid? A lot of this is personal opinion obviously, but I own the majority of the games in that bundle, and I think if I was in your situation (already owing smb and braid), it would still be worth the purchase for prison architect alone. Fez is good fun too. Insurgency is a great game, OS X version is quite bugged but its get better over time. A great, strategic, realistic fps.